This Tip of the Month is written by GrowJourney’s cofounder, Aaron von Frank. 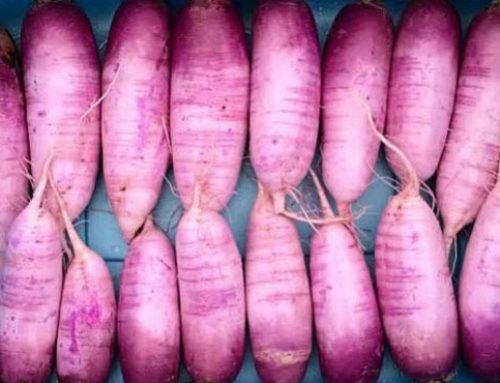 All photos in the article are from the von Frank’s edible organic yard in Greenville, SC. Modern conveniences make it very easy to forget that we are all a part of nature, not apart from nature. Sometimes that’s a good thing: being able to use satellite technology to see a hurricane headed towards you days in advance so as to flee to a safe location in your combustion engine vehicle is a much better alternative than clinging to the trunk of a tree through 125mph winds. 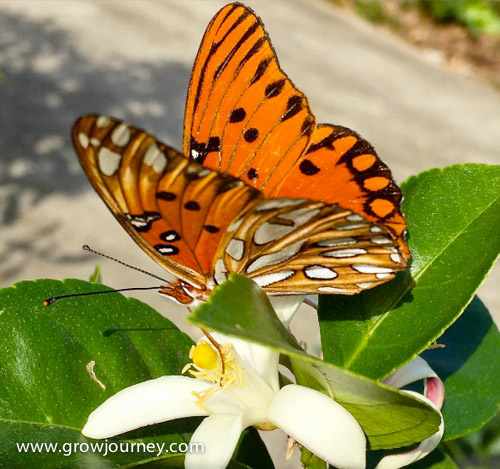 A Gulf fritillary butterfly visiting a Meyer lemon blossom. 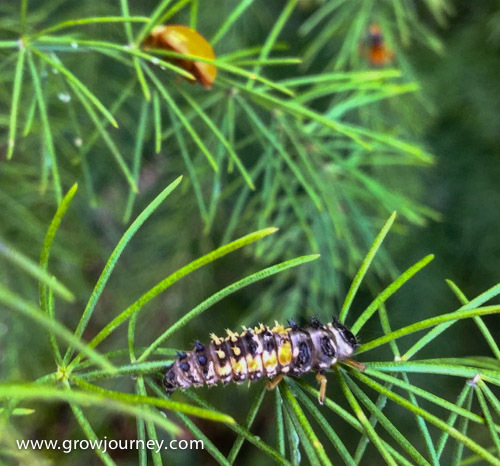 The butterflies are attractive at this stage in their lifecycle, but do you know what the larvae look like? But we do ourselves, and the natural world that sustains our wellbeing, a tremendous disservice by not appreciating its systems or the parts and pieces that make it all work. 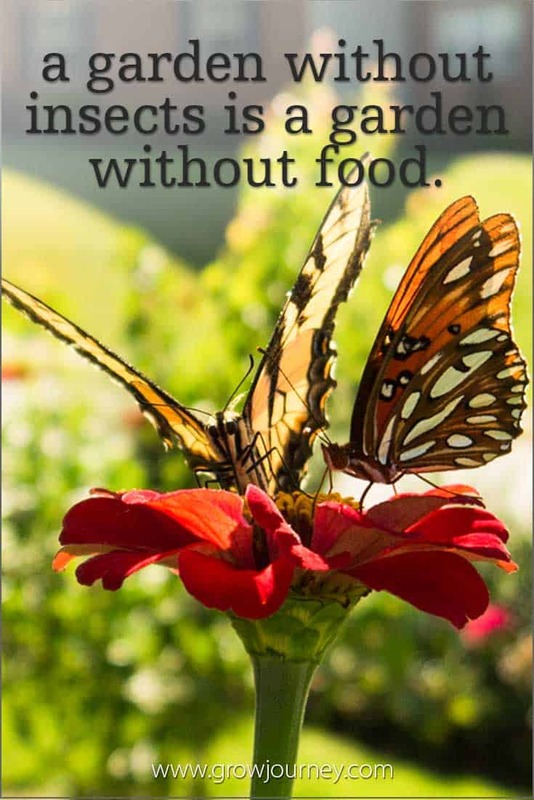 Perhaps nowhere is this more obvious than in our treatment of insects. Go into any garden center and you’ll find a huge selection of insecticides with names that speak directly to our desire to engage in perpetual warfare with the hordes of strange and scary creatures who happen to live in our yards: Onslaught, Conquer, etc..
Do you want to conquer and destroy this frightening looking creature? 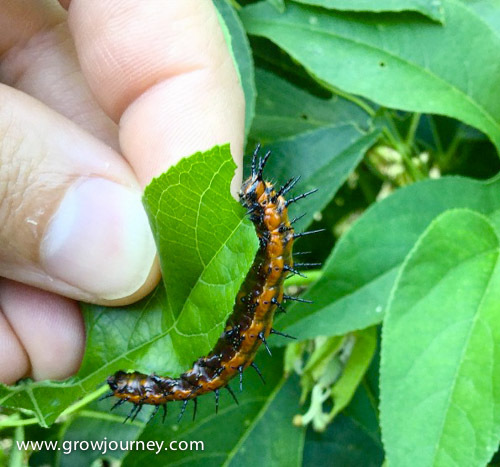 This is the larvae of the Gulf fritillary butterfly (the orange butterfly pictured above) on its host plant, the native passion fruit vine (Passiflora incarnata). The larvae look scary, but they’re completely harmless. It seems that people have come to hate insects so much that they’d rather replace them with endocrine disrupting carcinogenic chemicals in the home landscapes where their children and pets play. This not only ignores the critical role that insects perform in maintaining life on earth as we know it, but it also ignores the reality that we’re all biological organisms, and can thus be harmed by the same poisons we use to kill the other living things we don’t like (infants and young children are especially susceptible to various pesticides during critical stages of development). 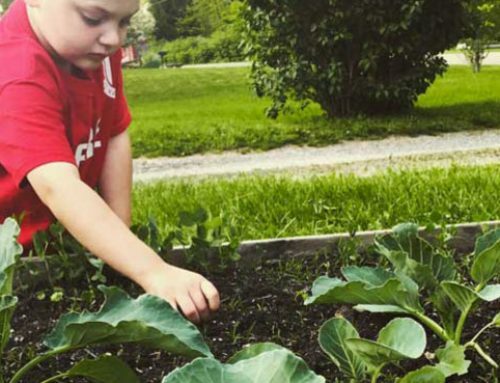 We’d like to encourage you towards a different goal in your yard: create an ecologically regenerative landscape that produces piles of safe, healthy organic food for you and your family. Warning: accomplishing this goal will require you to learn about and be comfortable with insects. Just think of them as a few hundred million extra pets that feed and walk themselves, while making food for you! This is a photo of Fluffy and Sam gathering nectar and pollinating our coriander/cilantro flowers. We have a few million pet ants in the yard. 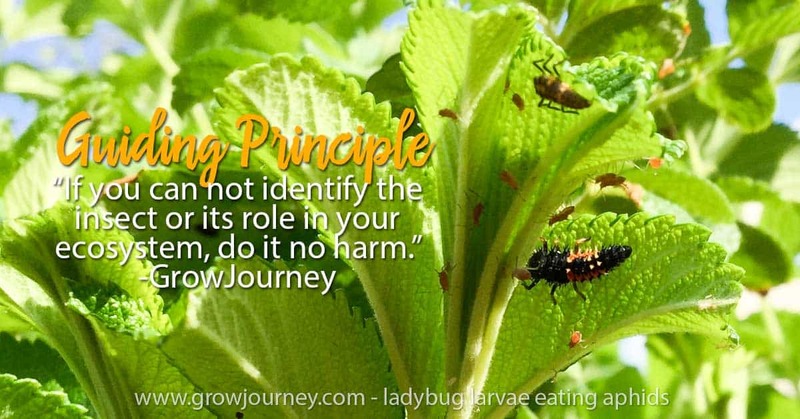 Yes, insects are responsible for pollinating a majority of the edible plants you’ll grow in your garden. 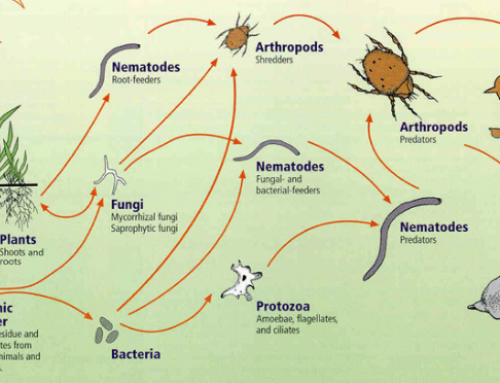 And the “good” insects are responsible for keeping the “bad” ones in check – without prey, there can be no predators. Ladybug larva in the foreground and adult ladybugs in the background. One day we noticed a lot of aphids (a sap-sucking “pest” insect) on these asparagus plants, so we decided to wait to see what would happen rather than fixing it. Two days later, our predatory insects had eaten all the aphids. What do you think would have happened if we’d sprayed the plants with insecticides instead? Given that 95% of all insects are considered beneficials (e.g. “good” insects) or benign (“harmless”), we highly suggest you put the poison spray down and learn how to use your insects as the valuable resource that they are. Definitions – How do you know if an insect is good, bad or ugly? Some scientists get irritated by the public’s hyper-fixation on “charismatic megafauna,” (e.g. the larger, cuter animals that make the cover of magazines) while those same concerned citizens could care less about conservation efforts for a less cuddly but equally important species like snails or pollinating insects that don’t produce honey. 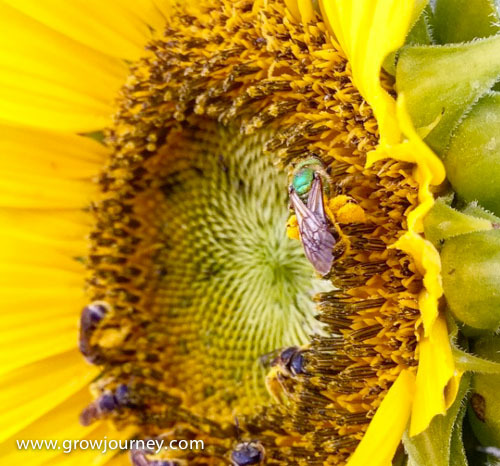 A beautiful species of native bee (Agapostemon splendens) foraging on sunflowers, a plant native to the Americas. The thousands of species of native bees don’t get as much attention as honeybees, but their populations are in steep decline in the US due to loss of habitat, intensive farming, pesticide use, and other factors. Read more about the causes of native bee population declines from two recent studies here. So don’t simply think of “good or bad” in terms of whether or not you can imagine giving the creature a belly rub, robbing its honey, or taking a selfie with it. In fact, these rather simplistic and arbitrary definitions might not even make sense at all, considering that so-called “bad” insects serve important roles in their ecosystems and are also usually food for good insects. Am I good or bad? The aptly named Handsome Meadow katydid (Orchelimum pulchellum) loves to munch on leaves, but it’s also a great food source for lots of other critters. Would you go to a restaurant that didn’t serve food? Will predatory insects, birds, lizards, frogs, or toads live in your yard if there are no pest insects to eat? Wasps aren’t just great pollinators (this one is foraging chive flowers), they’re also great predators. There are nests of paper wasps under our porches and we’re happy to have them. They have zero interest in stinging us because we’re not food, just big goofy creatures that occasionally walk around in their hunting and foraging grounds. 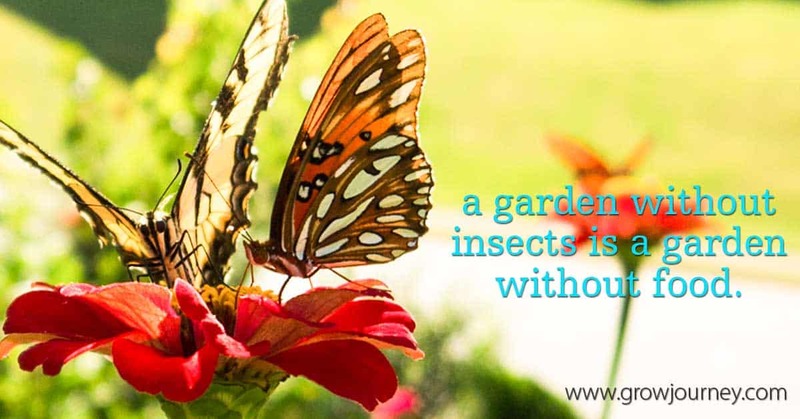 Bad Insects – Bad insects are generally defined as those insects that: (a) can harm or kill your garden plants, (b) spread disease, and/or (c) enjoy eating the same foods that you do. Is the beautiful little Melittia satyriniformis moth “bad”? You probably won’t want to take a selfie with one when its larvae burrow into your squash stems (yes, this is the “squash vine borer“). 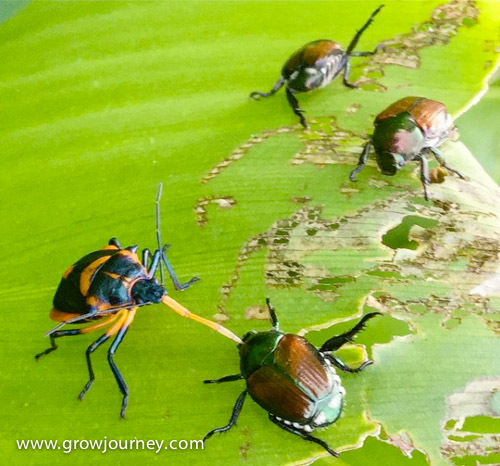 Make no mistake, there are some insects that we kill on sight when we see them in our gardens – squash vine borers (adults, eggs, or larvae) are one such creature. But rather than indiscriminately spraying our plants with poisons that kill/harm other beneficial insects, microorganisms, amphibians, reptiles, animals and humans, we prefer to use target-specific methods of eradication or deterrence that cause little to no impact on other species in the garden ecosystem. A “good” insect on the left (Florida Predatory stinkbug) eating a “bad” insect on the right (Japanese beetle). Ugly Insects – Ugly insects? Nope, sing along now: “Every-one is beau-ti-fuuuul, in their own waaaay!” Ray Stevens was clearly a huge insect fan when he wrote that song. As you start to learn and appreciate your insects, those once-ugly creatures will transform into beautiful and fascinating lifeforms right before your eyes. “I’m not ugly! Your momma… Now that’s ugly!” A trash-talking Assassin bug nymph. 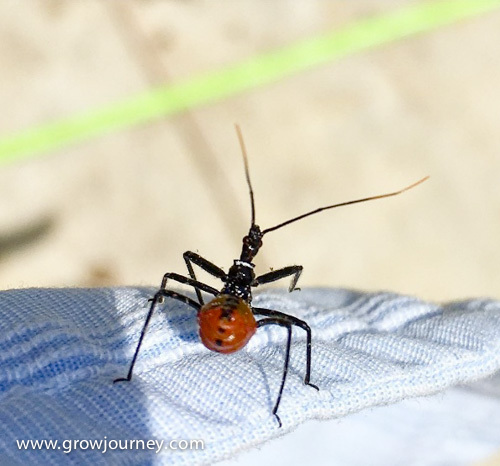 Assassin bugs are ferocious predators at every stage of their life cycle. How Do I Know Which Insects Are “Bad”? 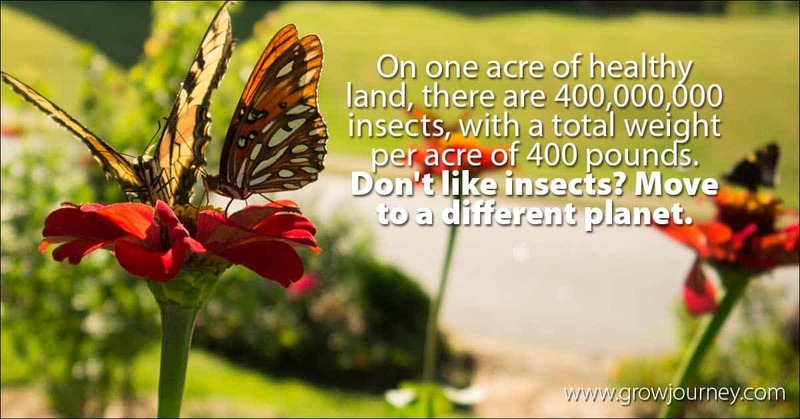 Regional Insect Variability – The insects in your garden are very likely to be different than the insects in our garden if you live in a different region of the country. If you’re an organic gardener, we highly encourage you to get a region-specific insect identification book, or find region-specific insect ID sources online (BugGuide.net is a good one). OMG! It’s an infestation… Of good predators. 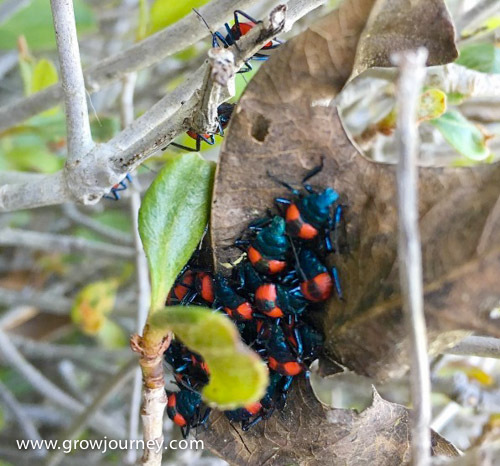 This is what the nymphs of Florida Predatory stinkbugs look like. Both the nymphs and the adults will hunt in groups. If you’re a pest insect, you should be terrified right now. 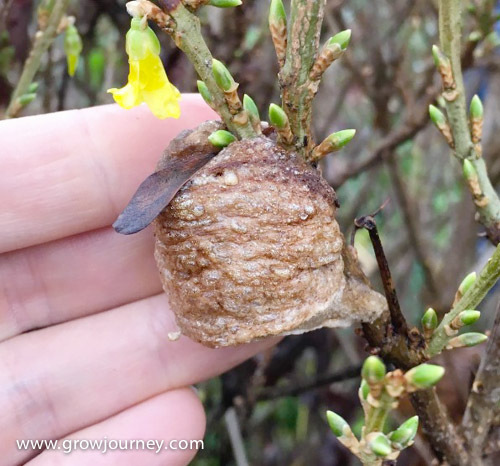 A Chinese mantis egg case, which looks a good bit different than the egg case of the native Carolina mantis. A Robber fly (the shark of the insect world) eating a Cabbage White butterfly. These butterflies are good pollinators, but farmers who grow brassicas (kale, cabbage, etc) tend to hate them since their larvae love eating brassica plants. Our paper wasps love hunting in our kale patches for their caterpillars/larvae. 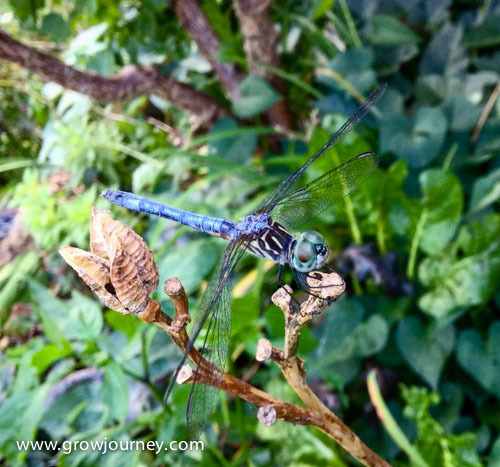 After we added a permanent aerated pond for our ducks, we noticed a marked increase in new species of beneficial insects which require water at various stages of their life cycle (such as this dragonfly, a great hunter of mosquitoes and other pest insects). “Primum non nocere“ (translation: “First, do no harm”) is a guiding principle in medical ethics. “Leave no trace” is a guiding ethic amongst conservationist and outdoor enthusiasts (and something you might have learned as a Boy Scout or Girl Scout when out camping in the woods). 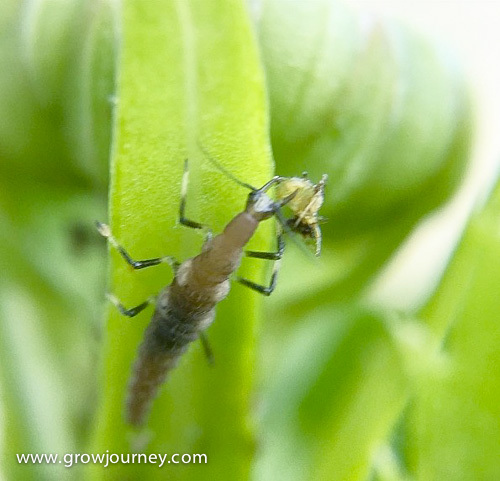 The tiny larvae of a lacewing moth eating a tinier aphid (sap-sucking pest insect). If you’ve ever seen a gorgeous white or light green moth that resembles a fairy, you’ve seen a lacewing moth. The larvae are predators, the adults are not. Soapy water – Take a bowl or small bucket of soapy water, grab the insect with your gloved hands, and drop it into the water. Squish – What do you do when you find a mosquito biting you? You squish it! As you become more comfortable with insects and you’ve been gardening for years, squishing a squash beetle with your hands won’t seem that terrible to you–just like swatting a mosquito probably seems normal to you now. Shoes work great too. Pheromone traps and trap crops – Pheromone traps can draw certain pest insects away from your plants and into a trap where you can easily dispose of them (as mentioned earlier, we trap Japanese beetles, a voracious pest insect, to feed to our ducks). 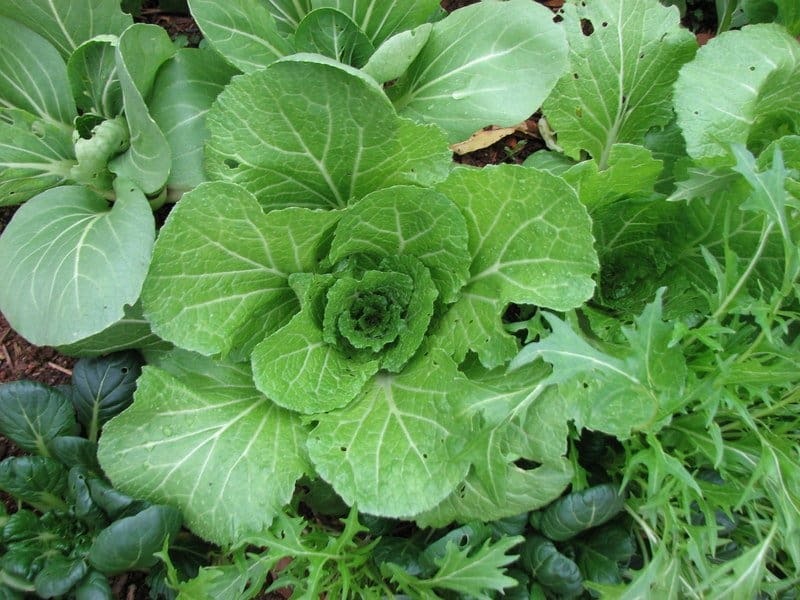 If you have a larger garden or farm, trap crops can be helpful. 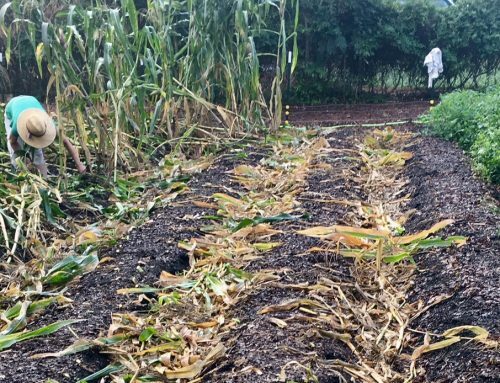 Trap crops are a companion planting method wherein you grow certain species of plants in close proximity in order to attract pest insects away from your higher value crops. A well-known example is planting mustards near strawberries to keep lygus bugs off of your strawberries. 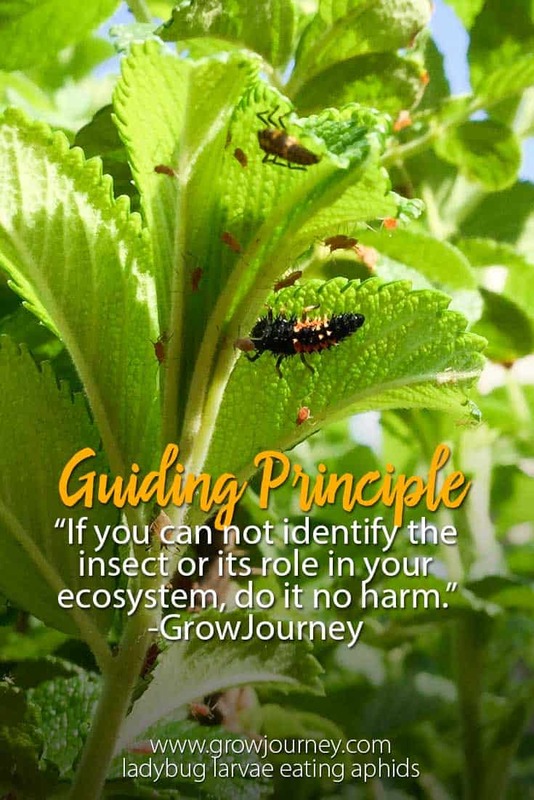 OMRI listed products – Horticultural oil, neem oil, etc – there are some good, safe insecticidal products that you can buy to help with certain types of pest insects. If you want to find a store-bought product that is both safe and effective, look for “OMRI listed” products. The Organic Materials Review Institute (OMRI) “is a 501(c)3 nonprofit organization that provides an independent review of products, such as fertilizers, pest controls, livestock health care products, and numerous other inputs that are intended for use in certified organic production and processing. When companies apply, OMRI reviews their products against the organic standards. Acceptable products are OMRI Listed®.” You can now find OMRI listed products in almost any garden center. 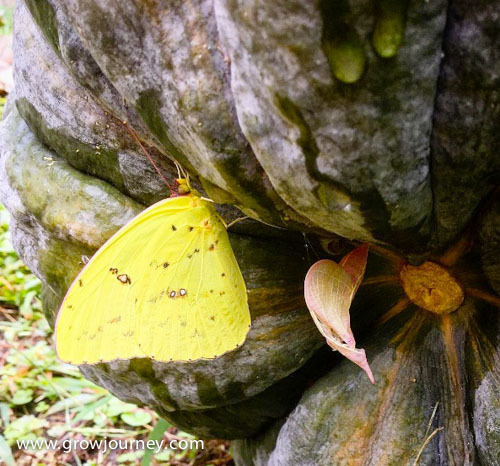 A Cloudless Giant Sulphur butterfly (Phoebis sennae) drying its wings after emerging from its chrysalis (the pink thingie) on the underside of a pumpkin. 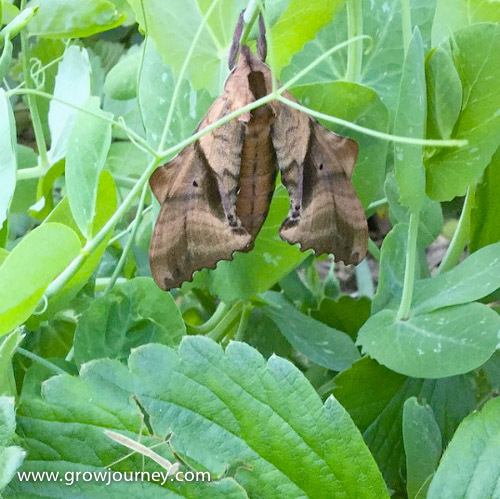 A sphinx moth hanging out on a pea plant, while a young praying mantis looks on from a strawberry leaf. 1. 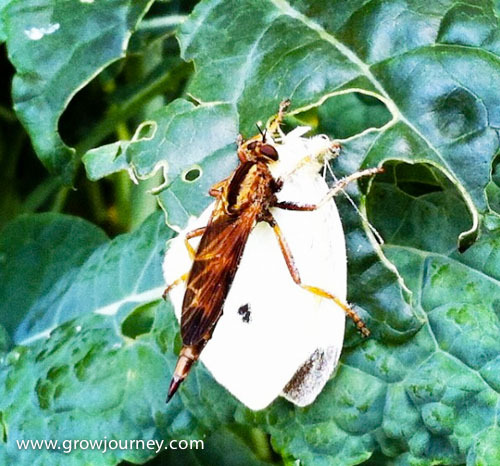 Biodiversity – Want to attract a ton of tomato pest insects to your garden? Plant all tomato plants. Otherwise, learn about plant guilds and companion planting (GrowJourney members can see that info in their online QuickGuides and GrowGuides). Biodiversity of plant species encourages biodiversity at other trophic levels as well. Interplanting different species together not only makes a more visually attractive landscape, it also reduces pest and disease pressure on any one species while providing a “diversified portfolio” effect on your garden harvests (if one thing dies, no problem – you’ll still have 20 other species of food producing plants to feed you dinner). 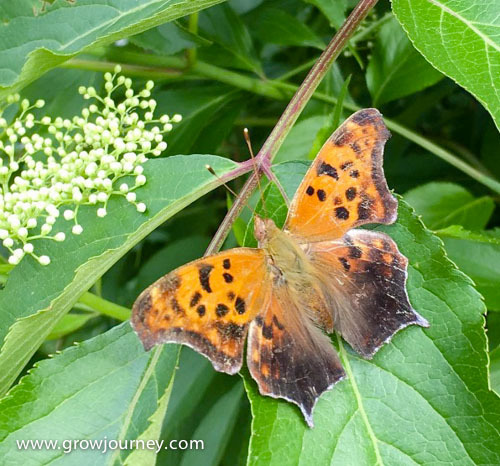 A Question Mark butterfly (Polygonia interrogationis) on an elderberry bush. 2. Three Flower Rule – As a general rule, always try to have at least three plants in bloom in your garden at all times during the warm weather growing seasons. (The more the better.) This will not only attract pollinators like bees and butterflies, it will also attract predatory insects whose diets include nectar, pollen, and pest insects. This might be more difficult during fall and winter gardening, but pest insects are also far less active during those seasons. 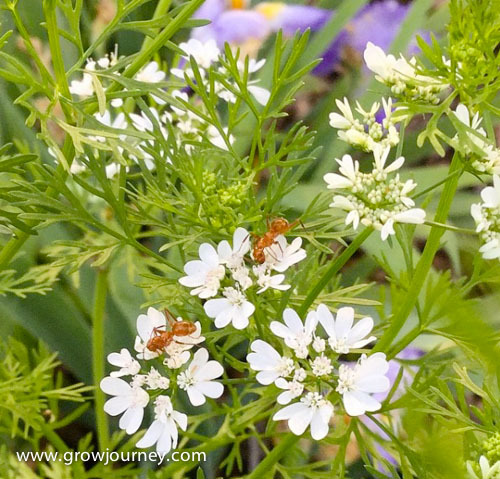 Don’t overlook small flowers (like cilantro, yarrow, carrots, elderberry) that can produce lots of nectar in addition to larger, showier flowers like lilies or daisies that tend to produce more pollen. 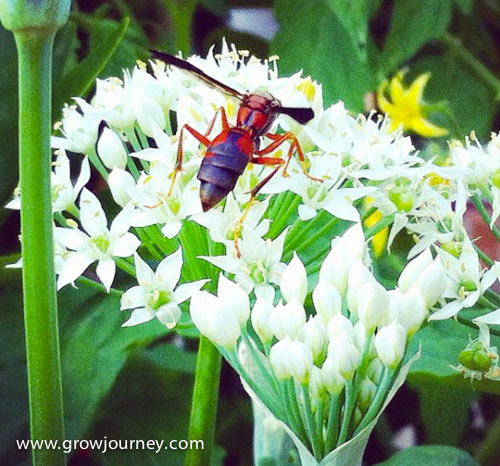 Different types of beneficial insects prefer different types of flowers. 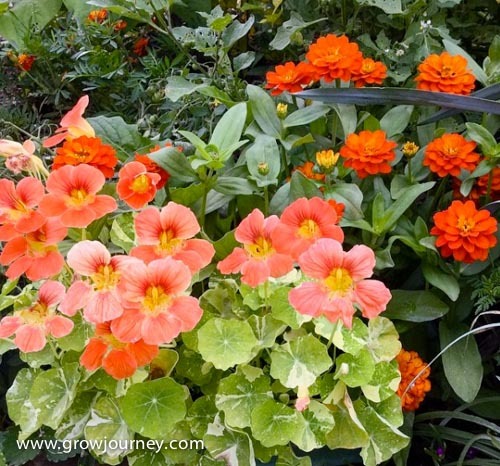 Variegated nasturtiums, dwarf zinnias, marigolds and other flowering plants grace the front of a garden bed. 3. No-Till Methods – Imagine you and your family are sleeping peacefully in your home. You’re jolted awake by a tornado siren. Then the next thing you know you hear a loud roar and the walls and roof of your home are ripped off. Sound terrifying? Now imagine that happening a couple times per year. Assuming you lived through it, you’d probably move out of the area fast. Just as a tornado, earthquake, or hurricane can do tremendous damage to human-built communities and infrastructure, so too can tilling kill many of the thousands of species of beneficial insects that live, overwinter, or lay eggs in your soil. Not to mention the damage that tillage does to all the beneficial microorganisms that work around the clock to build healthy soil. The other reasons not to till your soil? Over time (using the methods we talk about here), you can wave goodbye to weeding, fertilizing, and maybe even watering–all while increasing your yields! This is a Megachile xylocopoides bee. Notice how it stores the pollen it forages on its abdomen rather than as pollen baskets on its hind legs like many other bees. 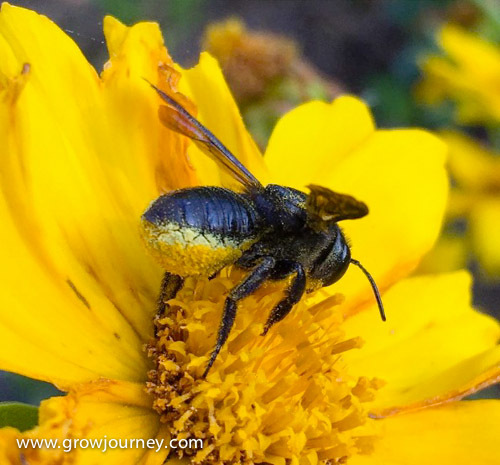 It’s a digger bee that likely has dug a hole in the ground nearby where she’ll make individual cells for each of her eggs, with a ball of pollen stored inside to feed the larvae as they grow. Another reason not to till your soil is to provide safe breeding habitat for all the native ground-dwelling bees. How cool is this: YOU have the power to make a dent in some of the world’s biggest problems. Your garden or yard can help save thousands of species of native pollinators and other beneficial insects; you can sequester significant amounts of greenhouse gases in your soil; you can help preserve rapidly disappearing varieties of heirloom/landrace seeds; you can help produce clean air and water. What do you get in return? 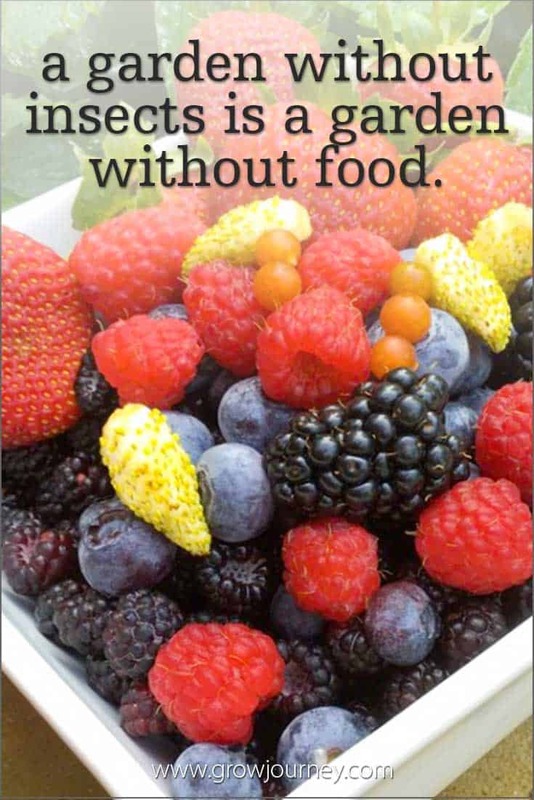 The ability to walk out your front door and harvest baskets full of healthy, garden-fresh organic food. Go get started now! Got questions? 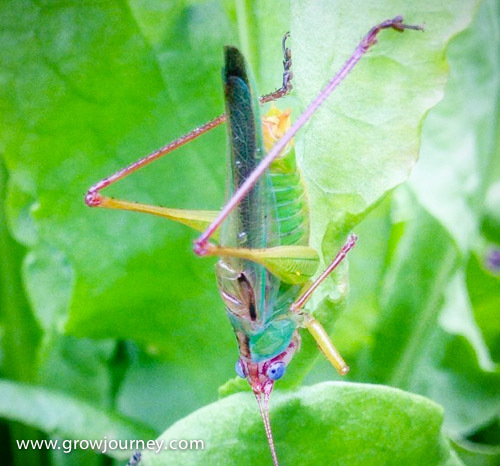 Have an inspiring story about working with your garden insects? Hit us up in the comments section below! We let our predatory insects control our pest insects. 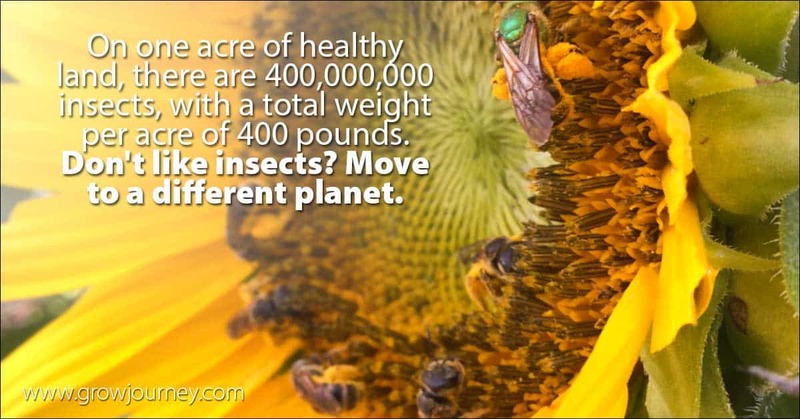 It’s an ecosystem that maintains its own balance for 99% of insects. The only ones we participate in managing our Japanese beetles (we trap them and use them as a food supplement for our ducks), harlequin bugs, and squash bugs. Any controls we use are carefully determined so as to minimize impact to other insects. A lot of time, that means simply picking them off by hand and plopping them in a bowl of soapy water. Worst case scenario, we might use neem oil or horticultural oil.